The Australian Florin was minted from 1910 until 1963 prior to the changeover to decimal currency in 1966. For the first 7 years the 2s was minted in London. For the rest of the life of the coin was mostly minted in Australia in either Melbourne or Sydney. The only exceptions to this were during World War 2 when some of the 1942/43/44 coins were also minted in the USA. 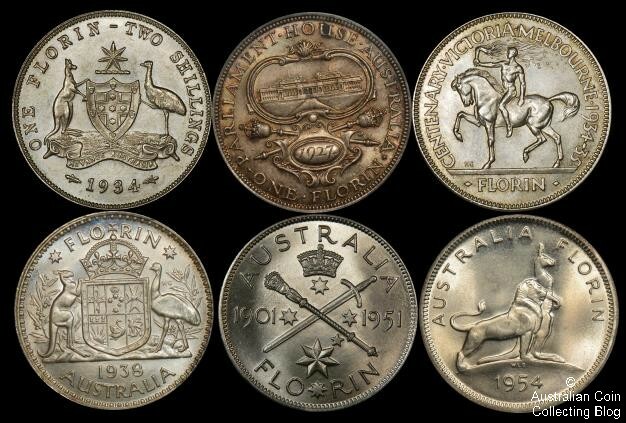 The Australian Florin was minted with 7 obverses, the Edward VII Florin, the 1927 Parliament Florin, the 1934-35 Centenary Florin, the George V Florin, the George VI Florin, the Elizabeth II Florin. Six reverse designs were used for Australian florins, the Coat of Arms reverse by W.H.J. Blakemore was the standard design until 1938. At that point an updated Coat of Arms reverse was designed by George Kruger Gray and it was used until 1963. In 1951 the the Federation Florin saw a commemorative reverse design used, as did 1954 when the the Royal Visit Florin was issued. Like all other pre-decimal Australian coinage the 2s was based on the silver standard. The 28.5mm, 11.31g coins were minted in sterling silver (92.5% silver, 7.5% copper) from 1910 till 1945. In 1946 the coins were debased to 50% silver, 40% copper, 5% nickel, and 5% zinc. The debasement resulted from Australia needing to pay off its’ huge debts incurred during World War 2. The Australian Florin is the most popular silver pre-decimal coin to collect bar none. It’s large size and loads of detail make it collectable in almost all grades, and the different commemorative issues make for additional collecting interest. We’ve got some tips for collecting the florin you can read too!